Planting may occur earlier than normal this year due to unseasonably warm, dry weather. Some of this planting may occur before the earliest planting date included in the COMBO policy, a crop insurance policy providing farm-level protection. Those acres planted before the earliest planting dates are not eligible for replant payments. Insurance guarantees will exist for crops planted before the earliest planting date given that good farming practices are followed. COMBO products – which include Yield Protection (YP), Revenue Protection with harvest price exclusion (RPwExcl), and Revenue Protection (RP) plans – have earliest planting dates. 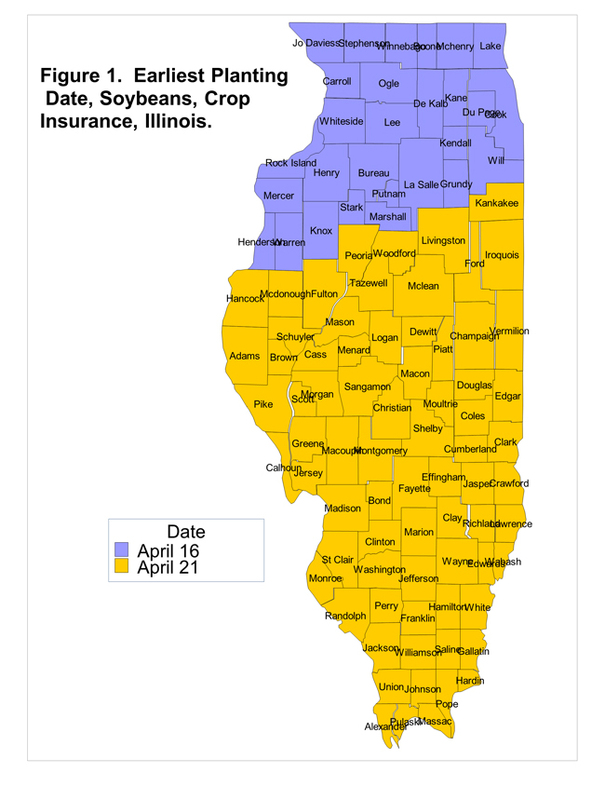 For corn in Illinois, the earliest planting date is April 6th, except for counties in the southern part of the state. Alexander, Hardin, Johnson, Massac, Pope, Pulaski, and Union county have an earliest planting date of April 1st. For soybeans, roughly the northern one-third counties have an earliest planting date of April 16th. The southern two-thirds of counties have an earliest planting date of April 21st. A map showing planting date by county is in Figure 1. Acres planted before the earliest planting date are not eligible for replant payments if those acres need to be replanted. These acres will still receive full coverage for yield or revenue losses if good management practices are followed. For example, take RP with an 80% coverage level having an 170 bushel Trend-Adjusted Actual Production History (TA-APH) yield. With this year’s $5.68 projected price, the minimum guarantee is $772 (170 bushel TA-APH yield x $5.68 projected price x .80 coverage level). The $772 per acre guarantee is in effect whether acres are planted before or after the earliest planting date. As with planting after the earliest planting date, good farming practices must be followed on acres planted before the earliest planting date. For acres planted before the earliest planting date, this may be a particular issue if the early planted acres result in a poor stand. If good farming practices dictate those acres should be replanted, those acres need to be replanted even though those acres will not receive replant payments. In most cases, the replant payment for corn will be $45.44 per acre for corn and $37.65 per acre for soybeans. The $45.44 corn replant payment equals 8 bushels times the 2012 projected price of $5.68 per bushel. The $37.65 soybean replant payment equals 3 bushels times the 2012 projected price of $12.55. The 8 bushel corn and 3 bushel soybean factor remain the same across years. Projected prices vary by year, resulting in varying replant payments across years. The $45.44 and $37.65 soybean payments are maximum payments. If a farm has APH yield below 40 bushels for corn or 15 bushels for soybeans, the replant payment will be the APH yield time 20% times the projected price. Will ACRE Pay in 2011 and 2012?